While pivotal clinical trials, such as CHAARTED, STAMPEDE, and LATITUDE, have demonstrated the efficacy of abiraterone acetate (Zytiga) and/or docetaxel in patients with castration-sensitive prostate cancer, there is still no clear standard of care. Based on these pivotal data, the FDA approved abiraterone in February 2018 for use in combination with prednisone for patients with metastatic high-risk castration-sensitive prostate cancer. Results from the phase III STAMPEDE trial showed that the addition of abiraterone to standard initial therapy lowered the relative risk of death by 37% and improved progression-free survival by 71%.2 However, the study included both nonmetastatic and metastatic patients. 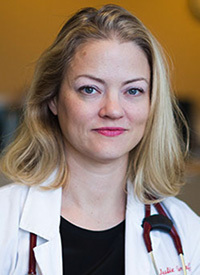 Julie Graff, MD, notes, however, that chemotherapy may be a more feasible option for these patients, and adds that more work must be done beyond abiraterone and chemotherapy to improve outcomes. Graff, an assistant professor of medicine at Oregon Health and Science University, lectured on early therapies for castration-sensitive prostate cancer at the 2018 OncLive® State of the Science Summit on Genitourinary Cancers. In an interview during the meeting, she shared insight on pivotal trials exploring abiraterone and docetaxel in this patient population. Graff: I spoke about the newer treatment options for newly diagnosed metastatic prostate cancer. This is cancer that has not yet been treated with hormone suppression therapy and/or cancer that is newly treated and is responding to that therapy. I spoke about 3 important studies; the first one is the CHAARTED study, which looked at ADT plus 6 cycles of docetaxel versus ADT alone. It showed a superior survival in the arm that got chemotherapy, and that has since become standard of care. That study was conducted in the United States, but there is another British study called STAMPEDE that also included this treatment arm. That study also showed that the addition of chemotherapy helped people live longer if they had metastatic disease. The STAMPEDE study also included patients without metastatic disease, whereas CHAARTED was only in patients with metastatic disease, so they are different studies. Then, I talked about LATITUDE, which is a study of ADT plus abiraterone and prednisone versus ADT alone. Abiraterone was continued until disease progression. This was for a high-risk group of patients; specifically, they had to have visceral disease, a Gleason 8, 9, and 10 and/or at least 3 bone metastases. They had to have 2 of the 3 high-risk features. Results showed that patients lived longer when they got the combination with abiraterone. STAMPEDE had an abiraterone arm as well and, again, patients lived longer, especially if they had metastatic disease. STAMPEDE had 2 other arms in it—one with ADT plus chemotherapy and the other with ADT plus abiraterone. [These arms] were recruited around the same time and [we can] pull out some data, showing the similarities in differences between the two of them. With regard to the phase III LATITUDE data that led to the FDA approval of abiraterone plus prednisone, does this mean that regimen is a new standard of care? For high-risk patients, we should be using abiraterone for newly diagnosed metastatic disease, or at least offering it. For the high-risk patients with visceral disease, many bone metastases, and high Gleason scores, we know now that those patients can live longer with early use of abiraterone. Is it the standard, or could we potentially use chemotherapy instead? We could use chemotherapy instead; we don’t really have head-to-head comparisons, even though we spoke about the 2 different STAMPEDE arms. It is not meant to be compared necessarily. I speak to my patients about their options. [Chemotherapy] is cheaper for the patient and abiraterone can be quite expensive. The chemotherapy finishes sooner while abiraterone is given until cancer progresses. Do your patients generally lean toward chemotherapy or abiraterone? I have talked to my patients about abiraterone versus chemotherapy and, so far, they have leaned toward abiraterone. A lot of patients want to avoid chemotherapy; I have had patients who have had heart failure and I didn’t think abiraterone would be safe [for them]. Therefore, they went on to receive chemotherapy. Where do you see the greatest unmet need in castration-sensitive prostate cancer? It is a cure. We are hoping people live longer, but invariably they relapse and eventually succumb to their disease. I do think it’s possible that we may have combinations for upfront metastatic disease that eliminate the cancer like we do for testicular cancer, for example, which we can cure with chemotherapy for metastatic disease. However, we are not there yet, and I’m not sure we are going to get there with just chemotherapy or these hormonal treatments. Going forward, what is your advice to community oncologists treating patients with castration-sensitive prostate cancer? My advice to community oncologists is to have a conversation with patients and give them their options. Interpret the STAMPEDE study carefully since it did include nonmetastatic CRPC as well as metastatic patients. Think about the patient’s comorbidities and financial situation, and help them decide what the best treatment option is there for them. Is there research you are currently working on that you would like to highlight? I am continuing to do immunotherapy research in metastatic castration-resistant disease. We have continued to enroll patients to the study we have available and seen some outstanding responses. This is with pembrolizumab (Keytruda) added to enzalutamide (Xtandi) for mCRPC that is progressing on enzalutamide. What are the biggest challenges in enrolling these patients? The challenges to enrolling patients depends on the trial. We have ones where it doesn’t matter what treatments they have received in the past, and they can get on [the trial]. We have others where you have to biopsy a metastatic deposit. In prostate cancer, a lot of the bone metastases can’t be biopsied so that has been a big hurdle for my study. There are studies now looking at DNA-repair defects, and only one-quarter of patients have those, so you can see in those studies how we are narrowing the pool. Fizaxi K, Tran N, Fein LE, et al; the LATITUDE investigators. LATITUDE: A phase 3 double-blind, randomized trial of androgen deprivation therapy (ADT) with abiraterone acetate (AA) plus prednisone (P) or placebos (PBOs) in newly diagnosed high-risk metastatic hormone-naïve prostate cancer (mHNPC) patients (pts). J Clin Oncol. 2017;35 (suppl; abstr LBA3). James ND, DeBono JS, Spears MR, et al. Adding abiraterone for men with high-risk prostate cancer (PCa) starting long-term androgen deprivation therapy (ADT): Survival results from STAMPEDE (NCT00268476). J Clin Oncol. 2017;35 (suppl; abstr LBA5003).